Station 4 is located on the corner of Lincoln St. and Main Ave. Sixteen firefighters, one officer, and one base radio operator are stationed here per shift. Engine 4 is built on a Sixby Fire Tech Vision II chassis which seats four firefighters. E-4 is a first alarm ALS engine. It is a very economic apparatus; it is not very large but carries a wide selection of equipment and has a 2000gpm pump with a deck gun. Ladder 4 is a new expanded cab ladder truck being produced by Fire-Fab, Intl. This truck has room for six firefighters in the cab. It has a 125ft extending ladder with a monitor on the end. It also has a compressed air system so the firefighters operating on the ladder do not need to worry about changing SCBA tanks. This is the largest piece of apparatus that LFC has purchased to date. 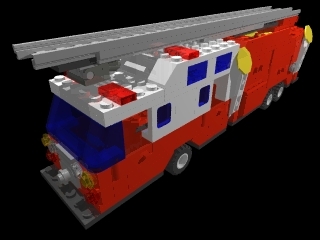 Heavy Medic 4 is a Fire-Fab K-Series two-man ambulance unit. M-4 can carry a stretcher and two people in the body. The truck is staffed by three Firefighter EMTs and is an ALS unit with cardiac support. This is the same style truck that is used as Heavy Medic 2. Rescue 4 is built on a Fire-Fab three-man rear engine chassis. This apparatus is classed as a rescue because it is not the primary pumper housed at Station 4 and it has a wide selection of equipment ranging form ALS gear to diving gear. Car 4 is an AM General Hummer, four door wagon style. This is the first Hummer that LFC has purchased to use as an officer's vehicle.